The Teen Queen welcomes you to her world in this fanmag! Can't get enough of teen queen Kathryn Bernardo? Well this fan magazine is exactly what you need for company! As a way of thanking her "solid" fans for their unrelenting support, Kath together with Candy releases Kathryn: A Candy Fan Magazine. "You've been such an inspiration to me, that's why I'd like to extend a big THANK YOU through this fan mag," Kath addresses Candy Girls in her opening letter. "I tried to make it extra special, because that's how you've always made me feel." Aside from learning more about this darling actress, you can also take a sneak peek inside She's Dating the Gangster—the highly anticipated Kathniel starrer based on the bestselling Pop Fiction book by Bianca Bernardino—that's set to hit theaters this July. 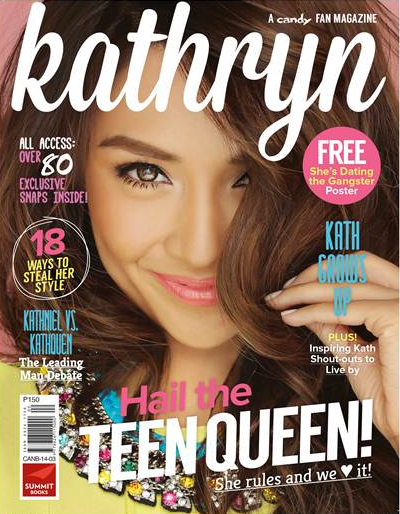 Kathryn: A Candy Fan Magazine is now available in bookstores and magazine stands nationwide for only P150.